Le Noël va bientôt arriver ! Il faut se preparer! Nous allons faire le dîner de Noël. Aussi, il faut faire le shopping pour acheter des cadeaux! ...In other words, we have a lot to do before le Noël! We only have a week to shop for our Pères Noël Secrets and to get our holiday dinner ready! Read the instructions and follow the links below to complete the activities for next week. There is a calendar of due dates at the bottom of the page. 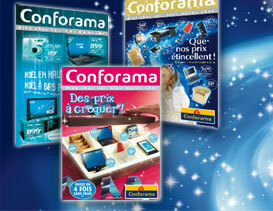 You will be finding "Secret Santa" gifts for each other from the popular French store CONFORAMA. French IV has a limit of 50 Euros. French II can spend 100 Euros. You should spend all of your money. When you find your gift or gifts, print off all of the information that you can find. (Picture, price, catalogue number, etc.) You will need this information next week when we "order" the gifts! You will also be researching French recipes and choosing one to bring to the diner de Noel. All groups except FROMAGE can work with a partner. Make sure you can count on your partner! If your partner is absent, and you have nothing to present, you will get a ZERO. If you do not have your recipe or your booklet on Wednesday, you will not participate in the dinner. Learning about French holiday meals and eating in courses. Discussing recipe ideas. Bring your ideas! Secret Santa Gifts Due! Order gifts and work on les cartes et le menu. Recipe or booklet due today. Order gifts and work on les cartes et le menu. Diner de Noel! Nous allons manger l'entree, le legume, et le plat principal aujourd'hui. Diner de Noel! Nous allons manger la salade, le fromage, et le dessert aujourd'hui!